I'm currently working with two main themes. My 'Wave' series and what I am calling my 'Flying Rib' pieces. I still have lots of variations in mind for both, so these will keep me busy for a while to come. The artistic elements I tend to employ most are motion, contrast and depth. A lot of my current work has elements that bridge the interior and exterior in some manner. I don't really have a favourite timber to turn. A lot of the wood I use is found, so I'm just happy when I find a nice piece to work with. I do tend to use a lot of walnut (Juglans regia) as it contrasts well with so many other species. 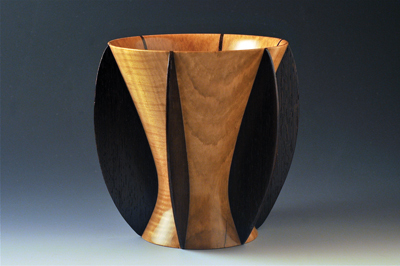 I think there is some wonderful work being done with carving, colour, and construction that is really pushing the boundaries of woodturning. I don't like all of the results, but I like that people are experimenting and trying things. Study and practice good form. No matter how beautiful the wood, or how creative the embellishments are, for a piece to be successful, the form must be good. What music and which book are you currently into at present? I listen to a pretty wide range of music including genres such as classic rock, country, Broadway musicals and blues. I've currently been exploring Bluegrass a bit more. My favourite genres to read are historical fiction, thrillers and biographies. I'm currently reading In One Person by John Irving. Because my pieces take many steps, I usually have four or six in process. 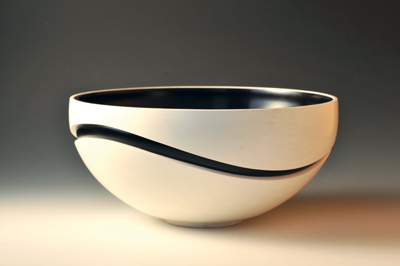 I spent a large part of today working on a black and white recessed wave piece that looks like a bowl within a bowl. I probably like making bowls the most. I don't really enjoy hollowing, but for me the end result is more important then the actual turning, so if a design calls for hollowing, I will do it. There are many people who have inspired me and helped me along the way. Two turners at the top of the list are Bill Luce for his pursuit of the perfect form and Mark Nantz for his craftsmanship. I think the AAW and the community they have built has probably done more for turning than anything else. I see myself continuing to evolve and expand as an artist. I would like to have my work shown in more galleries and do fewer shows. 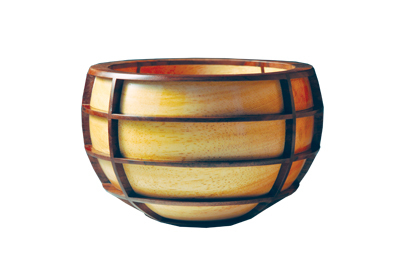 I don't think there's a hindrance to the development of woodturning as much as a hindrance to the perception of the craft as an art form. There is incredible work everywhere you turn, we just need to do a better job getting the public to recognise and respect it. I don't really dwell on regrets and negatives. 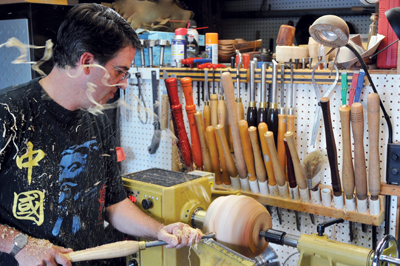 I feel blessed to have discovered woodturning at a time when my previous profession was going in a very negative direction. I play a sport called paddle tennis two or three times a week. It's basically tennis played on a two-third size tennis court with short paddles rather then racquets. I also enjoy mountain biking, ocean kayaking, skiing, golf, bocce, car racing and spending time with my family. Besides the lathe, the bandsaw, drum sander and glue.